I'm not sure why I remained skeptical of It's A 10 Miracle Leave-In Product for so long -- although it could have something to do with the fact that the name professed to work miracles, so I wondered how that could possibly be true. Well, witness me having a complete change of heart, because this product seriously delivers on its promise. Well, I am here to tell you that THIS. PRODUCT. WORKS. And not only does it work, it works WONDERS. Thanks to its combination of sunflower seed extract, green tea leaf extract, silk amino acids and Vitamin C (in addition to the benefits above), my hair has never looked or felt better. I liberally spray it all over wet hair the moment I step out of the shower -- and I do mean liberally, I'm spritzing it all over my strands to really coat them well. I've found that it makes blowdrying and flat ironing my hair easier, and I'm definitely seeing the benefits come to fruition! My hair had been very dry and damaged, not to mention dyeing it blonde made it all break off. Since using It's A 10, however, my hair just looks and feels so much healthier. I finally feel like my hair actually looks pretty again! I'm so glad I eventually gave in and tried It's A 10. It's definitely a miracle worker! 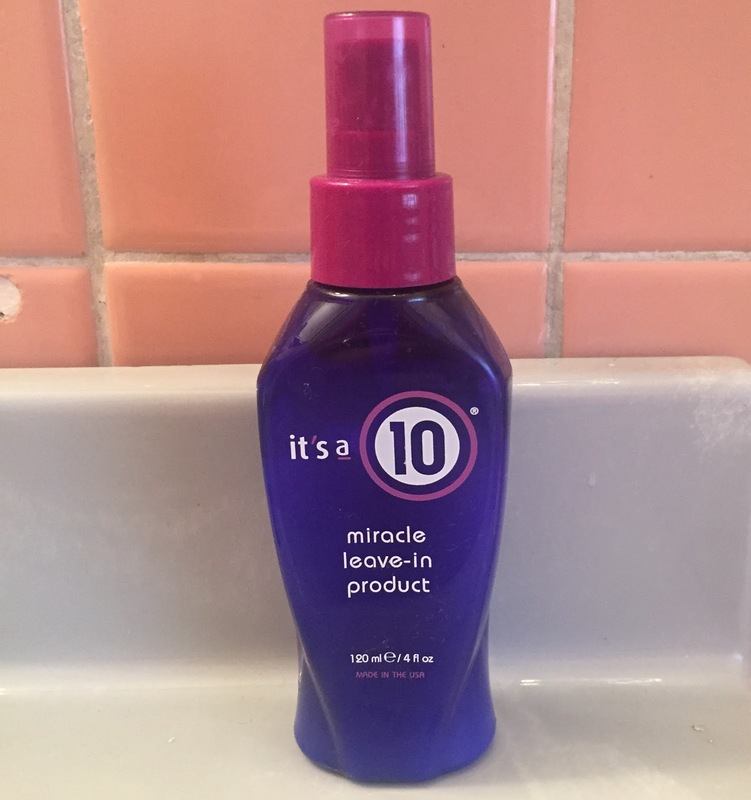 It's A 10 Miracle Leave-In Product retails for $18 at drugstore.com. I find I need leave in conditioners for the ends of my hair and not at the root. I'm a totally greasy root girl and it's been hard finding a shampoo that will not leave me greasy looking at the end of the day. I see that it detangles, too...this sounds interesting and I'll check it out. This sounds a great product. Hot styling and dying etc really do cause so much damage so it's good you've found something to protect from all that. I've started using a flat iron on my hair recently, so I think I need to pick this up! I adore this stuff. In fact, I'm off to shower and shampoo right now and I'll be using it! This sounds really nice! I have course, dry, wavy hair that basically looks crazy and I like the idea of spray leave-in conditioner. Thanks for reviewing this! This is intriguing! I use Indie conditioner and leave in which I love but am always looking for heat protecting sprays to combat my flat iron addiction! Great post. Great review. I always worry about shine sprays and leave in conditioners weighing my hair down, but I'll have to keep an eye out for this! I used this long ago and finished it which I never do. It is a great product that didn't weigh my hair down. I keep reading raves about this stuff but I have yet to buy it. Why? This sounds great. I've used a cleansing condish from It's A 10 and loved it. I'd like to try this sometime. I have not tried this, but it sounds like an absolute must-have! I picked up a bottle of this last month but haven't used it yet! Sounds perfect for me!